What hurts animals the most often remains hidden from view, but sometimes we get a glimpse into the plight so many have suffered. Christopher Haslett, an investigative photojournalist working to expose animal cruelty, has been trying to show what the illegal pet trade really looks like - and what he's found is a dark and twisted industry that threatens the survival of many endangered species. 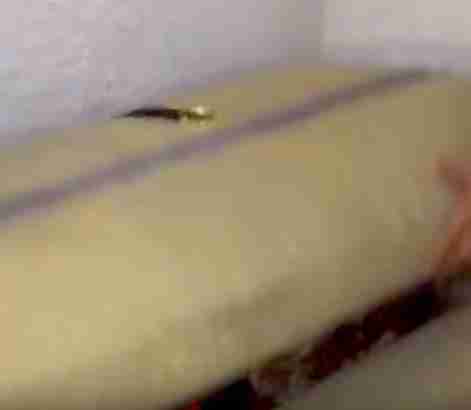 One of the latest videos Haslett found - and preserved before it was taken down from Instagram - captures the exotic pet trade industry in just a few seconds. 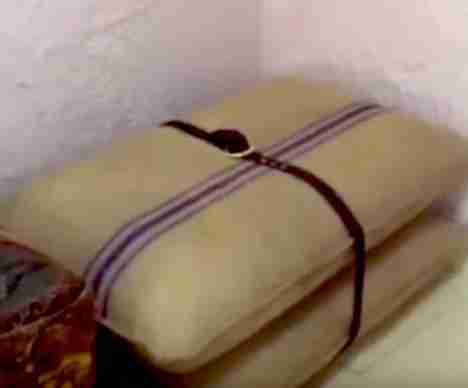 A container made to look like a bag of grain is slowly opened, so people can see how perfectly it conceals what no one would believe is inside. 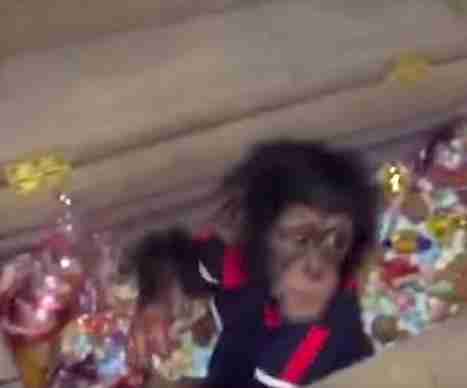 A baby chimpanzee dressed up as a toddler is revealed, ensconced in packing material and candy. A hand belonging to someone unseen drops into the frame to toss a bag of more sweets into the box, while an eerie, music-box melody plays in the background. 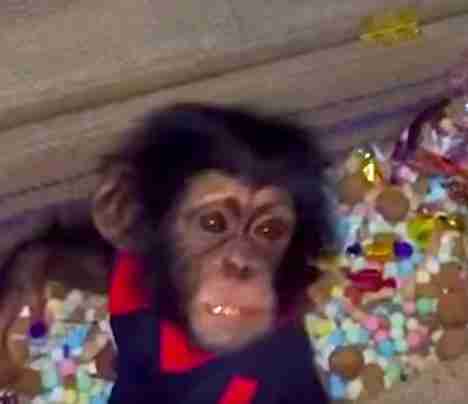 The chimp looks disoriented and anxious as he gorges on the candy. Baby apes like this one are kidnapped from the wild and trafficked across borders to be sold as pets. Usually, their mothers are killed in the process. "The irony is that the internet shrinks our world, but the traffickers remain physically out of reach because they operate from safe havens like the Gulf countries and some Asian jurisdictions," Haslett told The Dodo. "So we are mostly limited to watching them show off their deeds on social media. It's a very odd situation none of us could have foreseen 20 years ago." Haslett has been trying to figure out what happened to the chimp and where he is now. He's been chatting with a man who has been banned twice from Instagram for trying to sell apes. But Haslett's conversations with the man have so far proved evasive and unhelpful. Haslett is determined to keep trying. "There's a definite shyness when it comes to naming the traffickers publicly," Haslett said. "But animal defenders need to close this gap. I don't know if it's fear of reprisals, legal considerations or just that it's a harder mission that doesn't promise quick, happy results." One thing is clear, Haslett said. These animals need help, and traffickers need to feel the pressure. "If we don't start making them very, very uncomfortable they will go on doing what they're doing," he said. This is a developing story. The Dodo will continue to follow the case.